On Douglas Lake in East Tennessee, secluded and safe, is a temporary home for Bald Eagles and other birds of prey. Most are youngsters, hatched in captivity at the American Eagle Foundation, offspring of our non-releasable Bald Eagle breeding pairs. They are placed in the hack tower at around 7 weeks of age. During their time in the hack tower, they finish growing into strong and mighty eagles! They are safe from human contact and subsequently are able to have a very similar natural development as a wild-raised eaglet. At around 13 weeks of age, they are released into the foothills of the Great Smoky Mountains. Douglas Lake is a perfect habitat for these eagles, and in a few years, we might even see them return to the area from which they first fledged to build a nest and raise eaglets of their own! The Douglas Lake Hack Tower not only provides a fledging facility for birds that AEF cares for, but also welcomes birds of prey from nearby states. We will help any and every bird of prey we can, regardless of whether it’s a bald eagle or a vulture! For almost 20 years, this hack tower has served its purpose well, with 159 fledglings to date leaving their compartments to soar over Douglas Lake as they begin their adventures as healthy young eagles. Hacking is the method used to simulate Eagle nesting and Eagle population recovery in a particular area by releasing fledgling Eagles into the wild from an artificial nesting tower. The principle behind Eagle Hacking is that Eagles tend to return to the area from which they were raised and fledged (as close as within 25 miles) after they reach sexual maturity at 4 to 5 years age and choose a lifelong mate. The Douglas Lake Hack Tower is located approximately 25 miles northwest of the Pigeon Forge facility and approximately 2 miles south of Dandridge, Tennessee. It sits high above a secluded and private cove where humans do not disturb. Four hack compartments are constructed atop a 20-foot tower. The size of each compartment is approximately 8 feet x 8 feet x 8 feet. The AEF creates an environment inside the compartment that mimics the feel of their natural nest, with sticks around the edges and soft nesting materials inside. In addition, perches are in place to serve as branches for the young eaglets to practice branching, ‘wingercizing,’ and hovering in place. The compartments are side by side, with vertical bars—conduit pipes—spaced 4-inches apart in the center, separating each compartment. Vertical bars are also installed on a large front window that can be pulled up, via rope and pulley, when the Eagles of any cage are ready for release. These barred windows keep the Eaglets safe from predators while still allowing them to view fish on the surface of the lake below. The sides and rear of the cages are of solid wood, except that hack attendants can view the eaglets through 1-way glass from a covered platform behind the cages. The roof is in need of major repair, having withstood severe storms, insect damage, and other animal damages. 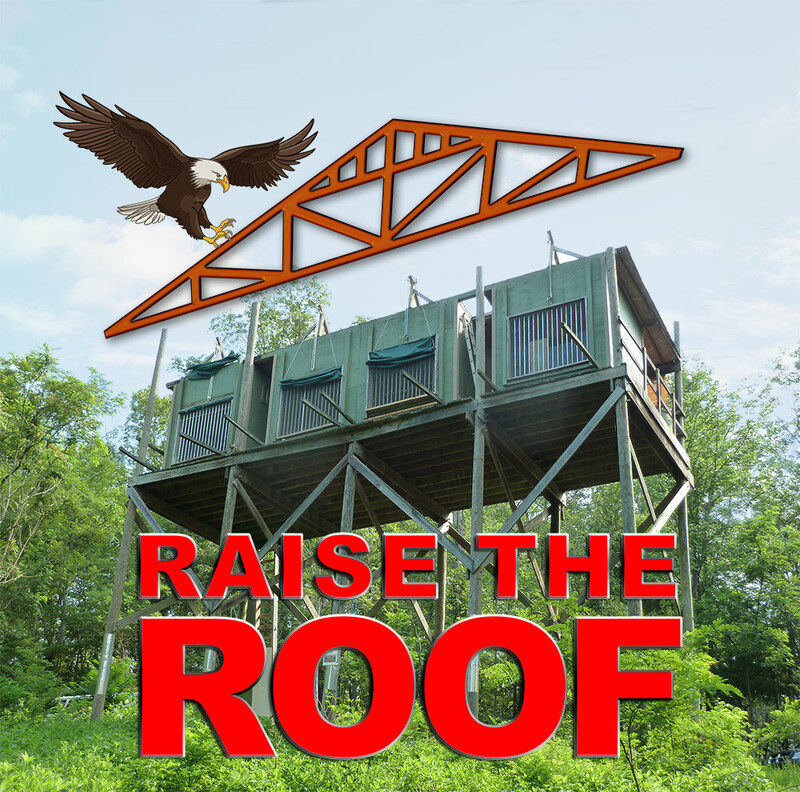 We want to give all eaglets and other birds of prey the best possible starting chance, and that starts with having a stable roof over their heads while they are in the hack tower. These repairs are costly. Our goal is $10,000, and we hope you will consider making a donation to this campaign. 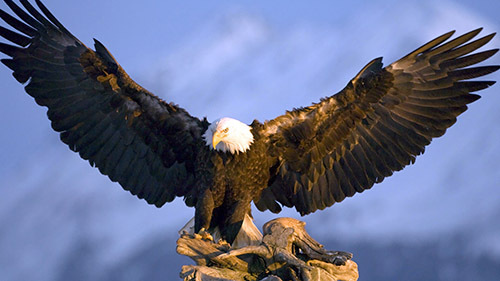 We thank you for all your continued support in helping keep America’s eagles flying strong and free. For a contribution of $1000 or more, your name will be permanently placed on the hack tower!